This article shows how to setup and use a custom analyzer in Elasticsearch using ElasticsearchCRUD. 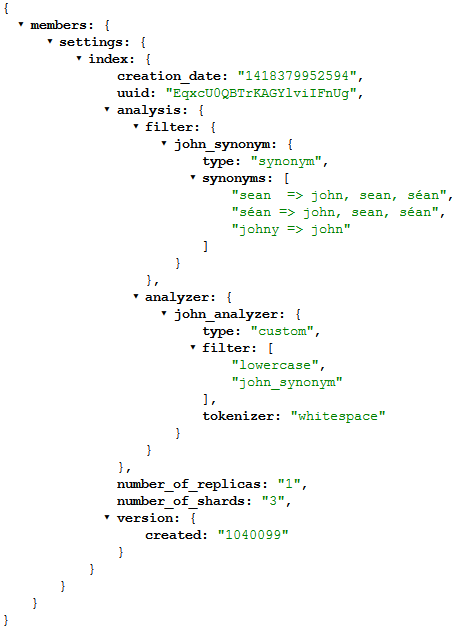 An analyzer with a custom Synonym Token Filter is created and added to the index. If you search for any of the synonyms, you will find all the hits for all the possible texts. 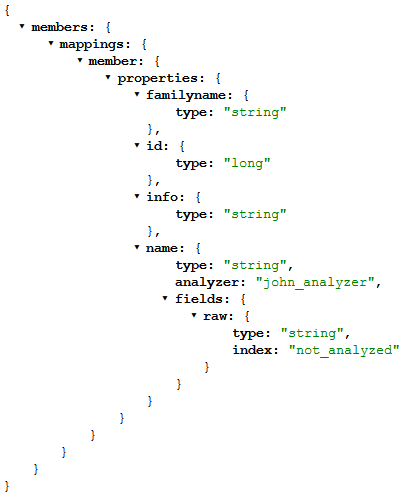 Creating an index with custom analyzers, filters or tokenizers is very easy to do in ElasticsearchCRUD. Strongly typed class configuration is available for all types as well as const definitions for all the default possibilities. In the example below, a SynonymTokenFilter is created and added to the custom analyzer. This is then included in the index mappings along with other configurations. Now a mapping is created for the member type using the Member class to map this. The Name property uses the custom analyzer and also saves the original text in a non-analyzed field using the Fields configuration. Now some data can be added to the index using a bulk insert. The data can be searched for using the query match as we want to search the analyzed fields. If you search for sean, séan, Sean, Séan, John, Johny, all john results will be found.